I can tell that I've become middle-aged, because I'm really looking forward to the emergency budget tomorrow*. Even though it's probably going to hurt in some way, but I shall doubtless get lots of vicarious pleasure from knowing that its going to hurt other people (BTLs esp.) a lot more! *the slippers and the cardigan are other give-aways. Now this is something I don't get. Why take pleasure in the misery of others? Its really not a nice trait. Should be fun listening to all the whining afterwards. If those others are BTLers then all bets are off, God hates BTLers. Plus, we've been bailing out their mistakes without being asked, so I'll take enormous pleasure if they get shafted hard in their arses tomorrow. The Budget looks set to be overkill, too much pain spread too wide, with of course, some exceptions. One such exception is rumoured to be a manipulation of Council Tax. Government will give more money to Councils to avoid increases. But Council Tax tends to fall most heavily on the prosperous, so it is th rich who will benefit from such a 'freeze'. 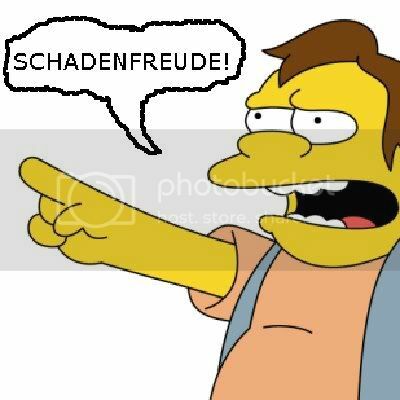 Did you mean "schadenfreude"? Taking pleasure from the misery of others. Babel fish translates this as "singing pigs joy"
I look forward to the singing pigs. When does Ozzy rise to his feet? Its going to be better more exciting than watching England go down 0-1 on Wednesday! I wish I had placed a Betfair now as I forecast England would be out after 3 matches. Not that I am anti- or anything just fed up with the boasting that goes on in this country as if HPI was something laudable. How can you be excited? Benefits to stay the same. I quite like my inlaws. There's always plenty to drink. I'm excited about it because I think this will be a historic budget that will be talked about for many years to come. Yes, it is going to be hard, but at least the government is going to attempt to cut back the monstrous giant hogweed that is the state. We've all been living in HPI-induced la-la land for far too long and reality is a big troll that is about to start clubbing the door down. What time does knob nose kick off? We spend £1.33 for every £1 we collect in tax. I'd love to see how you define overkill, because we need to swing the budget by 33% just to break even. I am looking forward to it not because it will hurt others, but to see how I can best plan my life to avoid as much of it as possible...just trying to adapt to new circumstances. For me the past 2 years of uncertainty and Brown/King throwing QE at everything has caused so much uncertainty and fear financially for HPCers I think... Your worry about buying a house fearing a crash as soon as you buy... and then you watch the lunancy of UK prices increasing whilst the rest of the Western World crashes... you are petrified of inflation eating your savings but you are scared of the stock market and all the other stuff, gold included, so what I am looking for is some certainty to plan ahead. That's what we all would like TMT...some stability and certainty back into life. You're looking in the wrong place TMT. The only certainty in life is that there is no certainty. Have to admit, if there is a big rise in CGT that brings a rush of property to the market I will be buying. Fingers crossed that HPCers are not let down. No? Perhaps even more ironic tomorrow ...?